On August 23rd, we celebrated our 18th year wedding anniversary which fell on a week day, so the prior weekend we went out to celebrate on a rare date night. 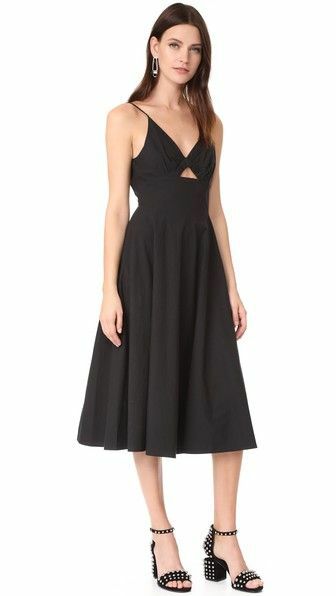 Since I haven't started to shop for maternity clothes, I was scurrying around my closet looking for something to wear when my eyes landed on this outfit which many thought was a black dress, but it is actually a blouse and skirt. It worked perfectly because the fabric of the skirt and top had some stretch so they could fit my ever expanding body. The positive feedback I received had me thinking how one can rarely go wrong with the lbd. In my very pregnant state, if there is some stretch to the fabric, then even if it is not maternity wear I can still wear it(well up to a certain point in pregnancy). In today's post, I've rounded up a couple little black dresses that caught my eye and that I think are perfect for date night. You look beautiful, sweet friend! There is nothing that can compare to the simplicity and elegance of a LBD.